The rain. Rain and none more, When it rains, I also get lazy (Corn Soup, Chinese Tofu Soup, Lentil Vegetable Soup & Creamy Mushroom Soup). You know how rainy weather is right? You just feel like dropping everything aside and cuddling in bed doing nothing (Thai Tomato Soup, Japanese Lotus Root Soup & Korean Radish Soup). Of course, career must go on. Wish we can work escape. We can actually because October is the month you should start thinking about clearing your annual leave. Otherwise, trust me, some companies are merciless. Come beginning of another new year or the cut of point, your leave will be conveniently forfeited. Tell me about such companies? Thus, when rainy season begins, maybe its one of the best times for you to take leave if you have no purpose of keeping your leave and like I have already told you, sit back, rest back and enjoy your time at home over a serving of such inviting, almost luxurious, smooth to all our senses and mildly spicy Kashmir Vegetable Soup (Lamb Rogan Josh). Kashmir and their soups? Oh-wonderful (Old Cucumber Soup). Of course, as usual, we need spices and a tinge of Kashmiri chilli powder for that heat which definitely our body can relate to cold weather (Vegan Pumpkin Soup) and for the vegetables, potato (Vegan Potato Curry & Aloo Gobi) is a fondness like in most, in fact in all countries throughout the world or whatever local produce vegetables will do (Rice Pilaf, Vegetable Kadhi, Hyderabadi Vegetable Biryani & Andra Sambar). Heat butter and sauté shallots, cinnamon and cloves. Add cumin powder, fennel powder, chilli powder and coriander powder. Stir, add tomatoes, potatoes and pour in vegetable stock. Let soup simmer till potatoes are cooked. Another stir and off the heat. wheee!! My favourite cuisine! Homecooked soup! its so good to see vegetarian dish at your space, perfect cold weather what we are having right now. comfort in a bowl. Yea it's annoying. Usually I just mark as spam. Too bad blog spot doesn't hv like disqus or wordpress where blog owner can blog certain words n ID from commenting. So many herbs. Sure flavourful. Looks wonderful! 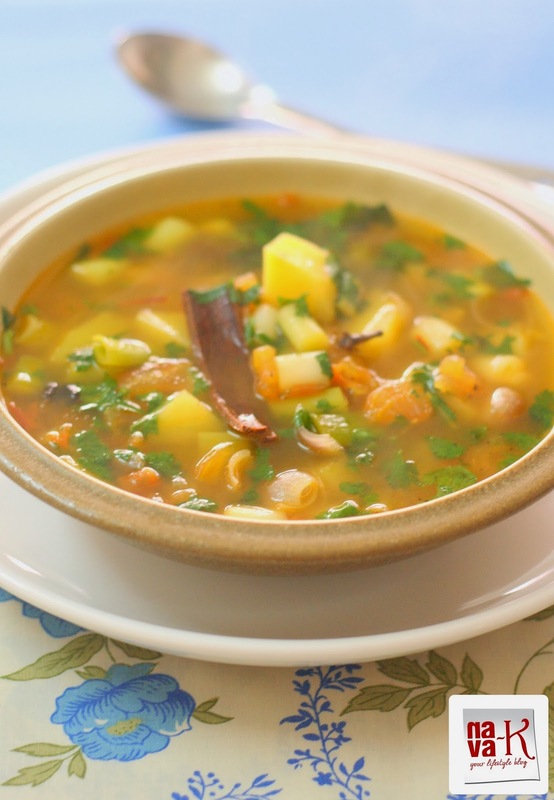 And just what we need now that our evenings are turning cooler...longing for some soup now! Potato in soup .Such a diff healthy soup.Yeah butter makes the soup creamier.You are so wonderful when it comes to clicks and flavours. A soup for raining day is perfect. Tomato is my son favorite. If for me may be i done know how to handle it. Looks awesome and photos are so professional. nava ,in u r ingredient list,potato is missing. wonderful color ,looks so wonderful.bookmarked. Nava, I've to agree that this bowl of soup is filled with the wholesome of goodness. A recipe fit for the young & old! Thanks everyone for the comments and esp to Meena for letting me know that potatoes were missing in the list. Actually I type tomatoes twice and there's where the mistake was. Looks so awesome and yummy. Nice looking soup, I have the same problem with spam but I decided to clean them up on a daily basis. Trying to block it gives difficulties for real commentators to add something to the article. 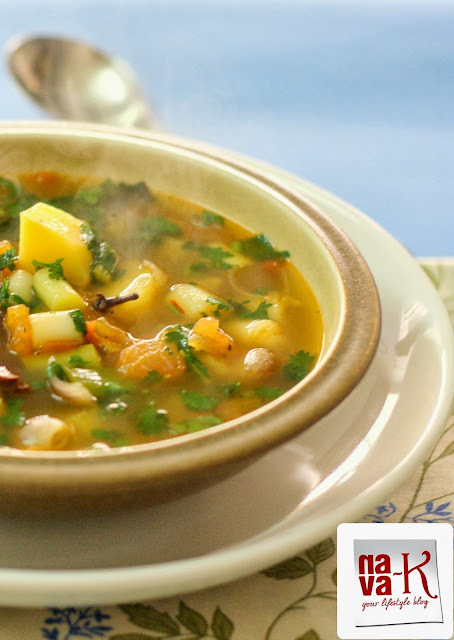 Simple and flavourful.....I love this heartwarming soup !! I totally agree with you about the spam part. I too keep on deleting them, as and when it appears. Love the sound of this, really filling and tasty. Perfect veggie soup for winter..I am yet to post soup recipes in my website..Tomato and potato is a wonderful combo.. I always see your wonderful comments but this is the first time I have seen a recipe from you. Very nice and interesting soup recipe. Oh Nava..I finished my lunch a while ago and yet I am hungry looking at this soup. Not only does it look fantastic, it has such wonderful ingredients in it. I need a big bowl of this NOW! The potato-tomato combination in a soup sounds nice. I am sure it tastes fabulous. Very refreshing soup especially when one is down with cold! Nava, when I moved to my own blog I was surprised to see the amount of spam comments I received the very first day. Then I set up Akismet web service to block spam. It is a very effective and free. The veggie soup looks good and I can see all the spices that you have used to make it flavorful. Flavorful vegetable soup with all these yummy ingredients, looks great. The potato soup looks yummy. Spammers are such a menace. spamming is really irritating..it eats away in the valuable blog time..